Much to my surprise, I have written nothing about Saudi Arabia's involvement in Yemen. The closest was Gas prices move up on Yemen fear premium more than three years ago, which didn't mention Saudi Arabia at all. I have also written nothing about Jamal Khashoggi. Considering that I'm interested in collapse and have worked as a journalist, those are both oversights on my part. * Fortunately for me, Vox has just provided me two opportunties to correct them. First, Vox uploaded how the Saudis ended up with so many American weapons yesterday. And why they want more. Saudi Arabia and the US have a partnership that's been in the making for over seven decades. It started after World War II and survived the Iranian Revolution, the Cold War, the Gulf War, September 11, and the proliferation of conflicts across the Middle East. 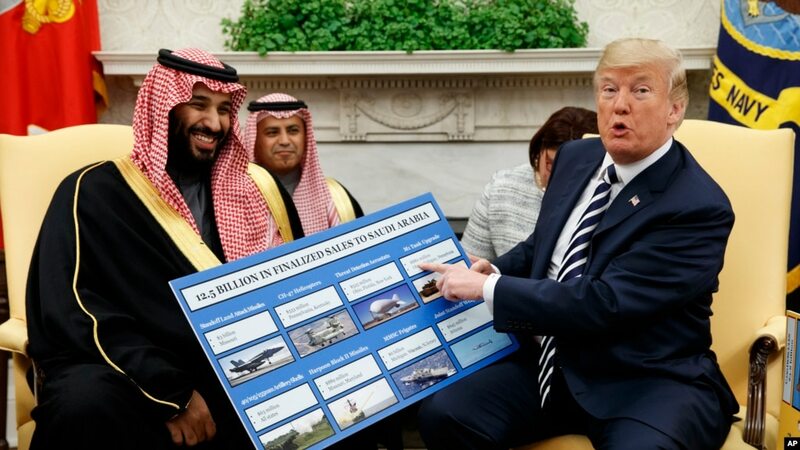 This whole time, the US has been selling weapons to Saudi Arabia -- now its number one customer. Saudis bought bombs, tanks, guns, and planes over the years to defend themselves from various threats. The US supplied those weapons because the Saudi’s threats have usually been a threat to the US as well. Today, there's a shift in the relationship. Saudi Arabia’s intervention in Yemen has created the worst humanitarian disaster in the world - and thrown the Middle East into chaos. The problem is, the Saudis are using US bombs to do it. This is not new. Vox uploaded The US may be aiding war crimes in Yemen two years ago. Nothing came of efforts to disentangle the U.S. from Saudi Arabia's involvement in Yemen then. That changed this week, as Vox reported The Senate just passed a resolution to end US support for the Saudi war in Yemen, writing "It’s a bipartisan rebuke of the Trump administration in the wake of Jamal Khashoggi’s murder." Sens. Bernie Sanders (I-VT), Mike Lee (R-UT), and Chris Murphy (D-CT) co-sponsored the resolution to stop US involvement in Yemen, where a Saudi-led coalition is fighting the Iran-backed Houthi rebels. The nearly four-year conflict has killed an estimated 50,000 people and put nearly 12 million on the brink of famine. The war in Yemen — and US support for the Saudi-led effort — actually began during the Obama administration. But President Trump has moved the US even closer to Saudi Arabia as part of his administration’s broader Middle East policy, which largely focuses on countering Iran. The horrific assassination of Khashoggi in the Saudi Consulate in Istanbul has put the US-Saudi relationship under a microscope, particularly after the CIA concluded that the country’s de facto leader, Crown Prince Mohammed bin Salman (MBS), ordered Khashoggi’s murder. The Senate resolution is a major step toward holding the administration accountable and wresting back some control of war powers from the executive branch. Yet it’s still a long way away from actually ending US support for the Saudis in Yemen, or finding a resolution to the conflict altogether. The White House in particular has pushed back against the Senate’s measure, and if it were to end up on Trump’s desk, it would almost certainly face a presidential veto. Additionally, the House approved a rule on Wednesday that blocks the chamber from taking up any Yemen resolutions before the end of the year, meaning the Senate resolution won’t advance. Well, phooey. With any luck, it will be reintroduced next year, when the House rule expires and the Democrats take over control of the body. If so, I'll re-examine the issue. Speaking of re-examining an issue, I wrote at the end of 'Treasures of the Earth' to replace 'The End of Suburbia' in my classes that "my readers should expect to see no more guides to answers to 'The End of Suburbia.'" It turns out I made an earlier promise in a comment to Guide to entries that contain answers to 'The End of Suburbia' that "The next updates will probably be more explicit answers to 21 and 22," in particular question 21, which asked "How has reliance on oil affected U.S. foreign policy since the 1970s?" I referred my readers to look up the Carter Doctrine, which I included in Gas prices rising in metro Detroit both good news and bad news. Carter's successor, President Ronald Reagan, extended the policy in October 1981 with what is sometimes called the "Reagan Corollary to the Carter Doctrine", which proclaimed that the United States would intervene to protect Saudi Arabia, whose security was threatened after the outbreak of the Iran–Iraq War. Thus, while the Carter Doctrine warned away outside forces from the region, the Reagan Corollary pledged to secure internal stability. In other words, the U.S. dependence on oil has been the reason why we have pledged to defend Saudi Arabia, which we have done to the present day, as the videos from Vox have explained. Given the current circumstances and leadership, it may be time to re-examine that position as well. *I've been concentrating on the fight against Daesh/ISIS/The Sith Jihad in Syria instead, which reflects the level of media attention. That's even though Yemen is just as good an example. It's time I looked at Yemen as well. Another country whose collapse I should write about is Venezuela. I have not written enough about its situation, either. I also plan on correcting that. Stay tuned. The dingbats in our government seem to be incapable of learning from history. Just as with the Shah of Iran, they simply assume the Saudi monarchy will stay in power for ever -- and they seem to have no plan at all for what they'll do when the inevitable happens. People in Iran today are still angry about the US quashing democracy in their country in 1953 to keep the Shah in power. Resentment in Arabia about our role in propping up the Saudi regime will probably last just as long -- and the Shah didn't even carry out the kind of murderous foreign aggression that the Saudis are now doing. Anyway, the arms sales do give us leverage over the Saudis. It's just that Trump is uninterested in using that leverage. Maybe Congress will do better. I have nothing to add to your comment except thanks for stopping by and linking to this entry at your blog.